Barbara Gerry is the great-granddaughter of John Nelson whose knitting machine revolutionized the knitting industry. Rockford's knitting companies were an important part of Rockford industry for 112 years. 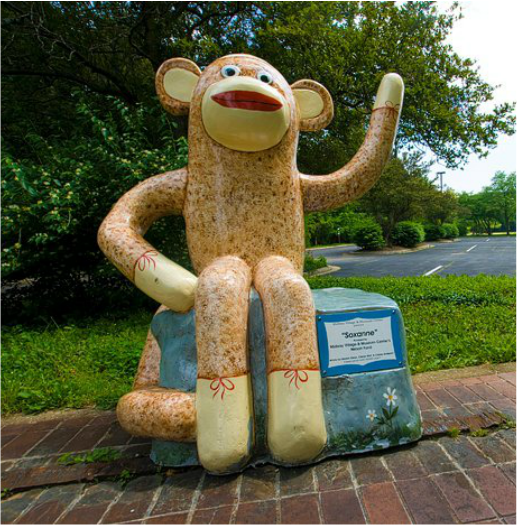 The SOCK MONKEY is traditionally made with Rockford Socks, the socks with the red heel. Although noone knows who made the first sock monkey, they were typically made from Rockford Socks, the "Socks with the Red Heels." 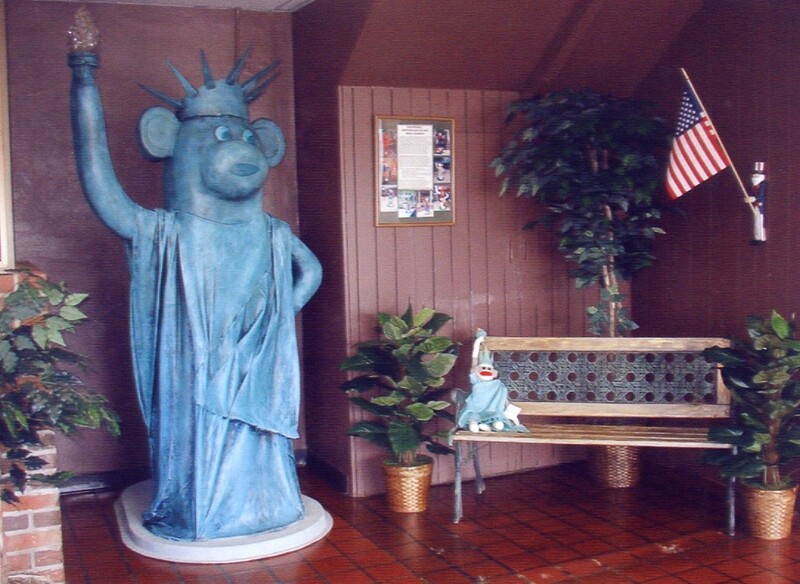 It is in this way that we can claim Rockford as the hometown of the Sock Monkey. 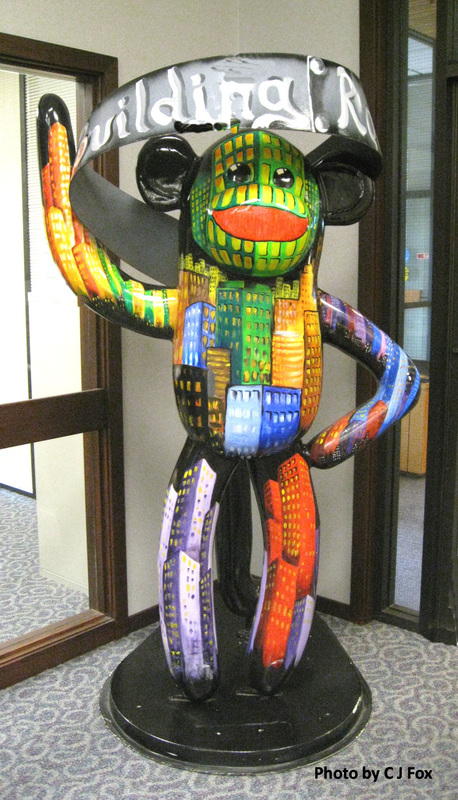 Mrs. Gerry suggested that Rockford make fiberglass sock monkeys, similar to the cows in Chicago, to promote their Rockford origins. Joan Sage, then the Director of Marketing for Midway Village and Museum Center, thought it was a great idea. 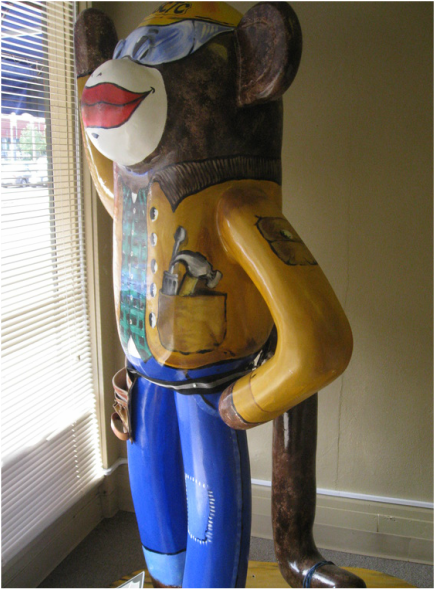 "The sock monkey is a part of Rockford's industrial heritage," she said. Together the two involved the community and people throughout the nation and around the world in "Sock Monkey Madness." The rest is history, as they say, which is where RHS comes in. 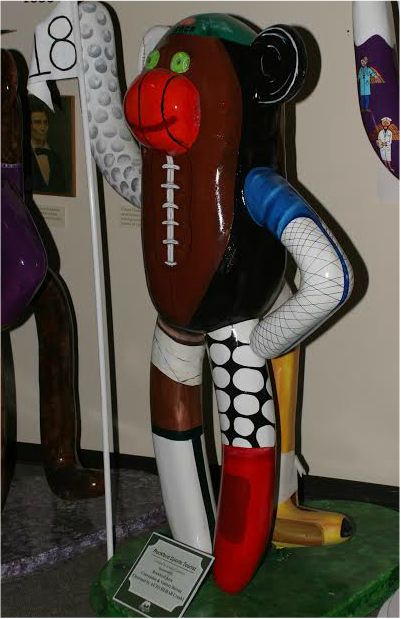 The Spring, 2015 issue of Nuggets of History features the fiberglass sock monkeys and is available from the Rockford Historical Society for $3.00 an issue. Twenty-two fiberglass sock monkeys were made, as far as we can tell. Below are pictures of twenty of them with a sketch of one more. One monkey, E.A.R.L., has no photographic record that we have been able to locate. National Lock Building - 7th St. & 18th Av. No picture or location available. PHOTO OF sock monkeys except where noted and Mrs. Gerry by CFox.